Corinne Missi was born in Yaoundé, Cameroon in 1995. At age 15, she moved to the United States to pursue her education. She recently graduated from Spring Hill College with a Bachelor of Science in Actuarial Mathematics with a minor in Business Administration. She is a former college Basketball player and Track and Field athlete. In her spare time she is an amateur model and designer and enjoys reading books. Corinne is the cofounder of SACAY Foundation, a Cameroonian non-profit organization that supports women and children in need in rural areas. Over the years, she has volunteered for health and education campaigns across different villages in Cameroon. 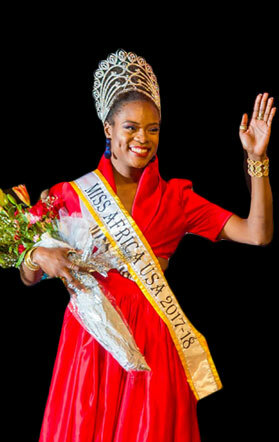 Her platform for Miss Africa USA is focused on girls’ education and women empowerment. Corinne believes the female population is the essence of humanity as women are the backbone of society. She hopes to make a difference in as many African girls’ and women’s lives as possible through serving, leading, and empowering. My name is Nereida Lobo, I was born and raised in the African Islands of the Republic of Cape Verde, experiencing the rich culture of the tropical climate of West Africa. I believe this initial exposure to the beauty of nature and life endeared me towards appreciating and loving people and has stayed with me till this day. I am honored and delighted to represent the paradise islands of Cape Verde. I moved to the United States when I was 11, and it opened up my world to a new journey of life and experiences. As the oldest of five siblings, I have always learned to take responsibility not just for myself but for others and set examples. With this passion I intend to impact the lives of all those I come across especially children. As a contestant on the 2016 Miss Africa-USA pageant, I am sharing my mission to help better prepare African Children to compete globally. I plan to do this because every day that passes without equipping African children with the tools to compete globally, is an additional day that African children must remain oppressed by their more advanced counterparts in other parts of the world. And quite honestly, we owe it to all of our children a voice in this world, and a sitting place at the table of global influence and decision makers. We owe it to our children the guidance that transforms their minds into leaders, and enhances them into voices of change for their generation, and generations to come. To accomplish this, I will be advocating for our children adequate school supplies, and information tools that would allow them to use their imagination in a powerful way. Through initiatives of African countries committed to shielding our children from ignorance and equipping them with the passion to pursue knowledge, we can set Africa on the path of being a great contributor, and competitor in the globe. As contestant of Miss Africa-USA pageant, or the reigning Miss Africa-USA, I would be better positioned to share, and work on my vision and my platform of Helping Africa Become a Place of Great Pride. Apart from these aspirations I try to make time for fun. I play soccer, I like to dance Kizomba music, and enjoy the thrill of traveling; I have always loved it simply because I love learning new languages and appreciating different cultures. Presently, I speak four languages, Créole, Portuguese, English and Spanish. Language is such an important part of my life because I have learned it bridges gaps and connects people together from all walks of life. I graduated from the Washington Adventist University, with a bachelor’s of science degree in Counseling Psychology. I am hoping to pursue my Masters in 2017. Thank You for this opportunity, and I am counting on your help to promote a generation of leaders, through access to adequate school supplies, education, and information so they can surely compete globally as Our Children of Africa. My name is Meron Wudneh. I am honored and delighted to represent Ethiopia, an ancient African country with amazing bio diversity, people who take pride in preserving their diverse culture, it’s great warriors, Kings and Queens! I love dancing our traditional dances Eskista, playing sports and bringing visibility to our culture through fashion which inspired a greater love of modeling. I model in NY, and also work in MD for Montgomery County in the field of healthcare and recreation where we develop youth programs. Ghyslaine Tchouaga is a Cameroonian native, born and raised in Yaoundé, Cameroon and moved to the United States to continue her education. She holds numerous titles, she is an aunt, a daughter, a sister, a student and a humanitarian, but one of her most important title came during this summer when she was selected to represent Cameroon at the Miss Africa USA pageant this year. She is God fearing and loves different cuisine. Fifi Souma is from the Republic of Guinea Conakry, 21 yrs old, speaks fluent French and English, Full time student at Montgomery College with a major in Communication. Fifi’s platform is to raise awareness and fight against the practice of Female Genital Mutilation (FGM), promote Education of the Girl Child in Guinea and to continue as a Goodwill Ambassador volunteering for America by teaming up with charitable organizations across the United States to serve needy communities. 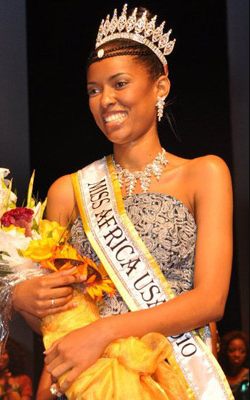 In 2009 she won the title of Miss Africa USA as a beauty ambassador to the entire continent of Africa in the US. During her reign she did over 200 appearances including the Super bowl, building homes with Habitat for Humanity, was featured on BBC World, President Obama’s Inauguration, and was a celeb spokesperson for Russell Simmon’s ‘Diamond Empowerment Fund’ along with Kim Kardashian. She’s appeared in magazines like J’Dore and Us Weekly, along with being dressed personally by fashion legend Jean Paul Gaultier. 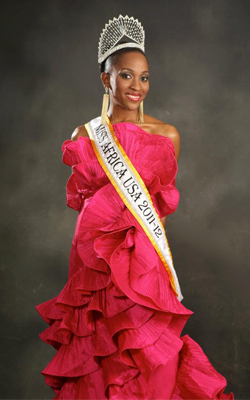 Atlanta, Georgia: The 3rd Annual Miss Africa USA Scholarship Pageant was recently held on November 3rd 2007 at the Ashok International Center in Atlanta Georgia. 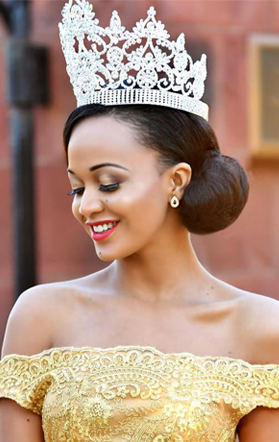 The Pageant was attended by hundreds of Africans and friends of Africa. Considered the toughest episode ever, the 2007 competition featured 17 beauties who made it to the finals all ready to claim the thrown as Queen. 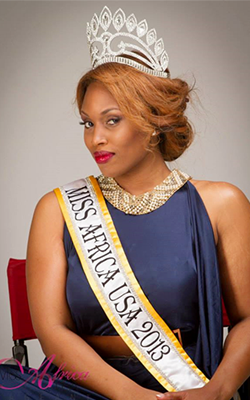 In the end, Nigeria's delegate, Miss Mfonobong Essiet, an experienced humanitarian was crowned as the Miss Africa USA 2007-2008. 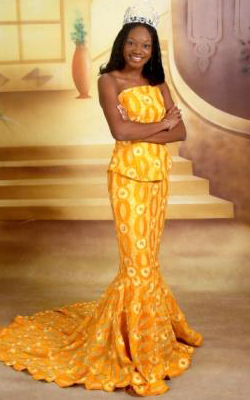 Shortly after winning the pageant in 2006, Miss Teizue Gayflor set out to achieve her platform: Promoting Education and Peace in her native Liberia. Miss Teizue who immigrated to the United States at a very young age, remained very passionate about the situation in Liberia especially the plight of children during and after the War that raged on for many years. As Miss Africa USA she was able to achieve her dream of giving back to Liberia by helping and inspiring children on Education. She visited several schools in Morovia and the outskirts talking to children about the importaince of Education. 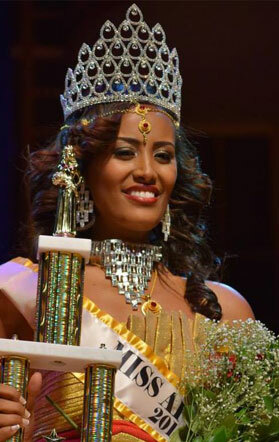 Miss Africa USA pageant was first launched in Atlanta Georgia in 2005 when 17 young women from different African nations resident in Georgia took part in what was then called Miss Africa Georgia Pageant. Over 500 guests gathered at the Global Mall of Geogia to witness this spectacular event. Pageant contestants are college students from local Universities in Georgia who wanted to showcase the different cultural aspects of their countries.